This 20 ft. x 20 ft. Vista Peak-Top Party Tent by Eureka comes with 8 ft. legs, and is constructed of durable 2 in. aluminum tubing, and the cross-cable supported floating center pole eliminates the need for a standing center pole. 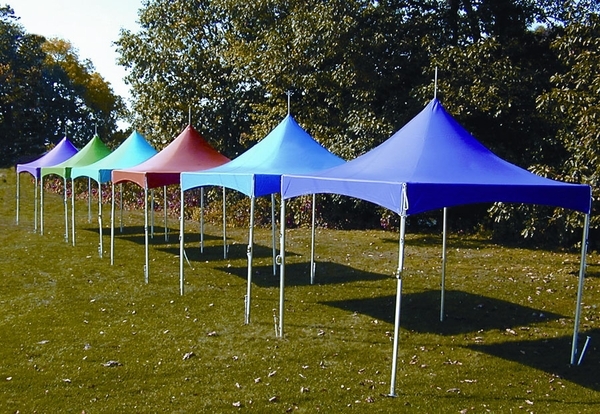 This party tent provides approximately 400 sq. ft. of covered space and the sturdy one-piece 13 oz. blockout vinyl top resists fire and mildew. This tent includes all the necessary poles and stakes. PLEASE NOTE: Solid color tops are made-to-order and cannot be canceled or returned, and often take longer to process and ship.